North County San Diego is a beautiful region. In addition to being the second most populated area in the county, after San Diego, it has some of the most perfect beaches and golf courses in the country. Some of its lagoons are now protected so they remain as natural as possible. If you love amazing food, you need to visit North County. Here, you’ll find Addison at The Grand Del Mar and El Bizcocho at Rancho Bernardo Inn, SoCal’s only five-star and five-diamond restaurants. 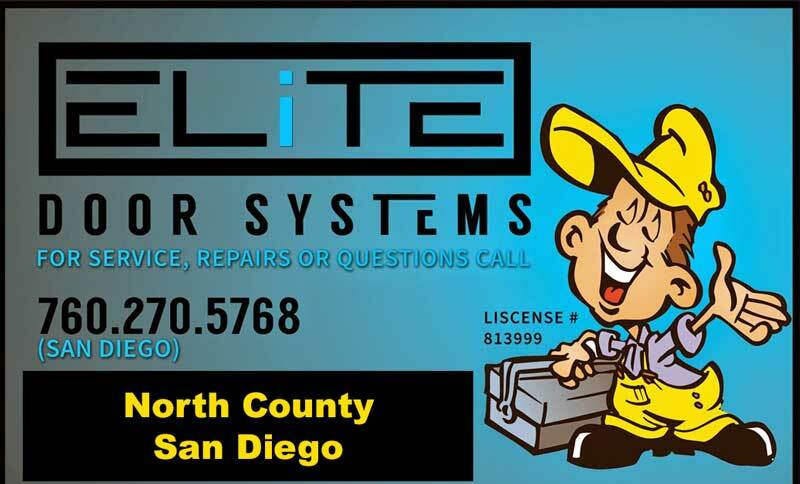 You’ll also find the best garage door installation and repair company, Elite Door Systems. We’re committed to providing the best service in the business to all of our clients. Homes in North County are among some of the most beautiful and expensive in the area. This includes their garage door systems. You don’t let your lawn become overgrown in such lovely neighborhoods; you certainly don’t want your garage door system to be noisy, jerky and annoying. Right? Here at Elite Door Systems, we want the very best for you. That’s why we’re ready to help you with all your garage door system needs, from full installations to annual inspections. We also specialize in garage door spring repairs. We chose to specialize in this particular type of repairs for one reason: only specialists can get the job done safely and we want to see our clients stay safe. Garage door spring repairs are one of the most dangerous home repairs on the list. You don’t attempt to repair gas lines on your own and you shouldn’t attempt garage door spring repairs, either. Granted, you won’t blow yourself up attempting to do your own garage door spring repairs, but you could cause major property damage and, even worse, significant personal injury, even death. These repairs are so potentially dangerous that most garage door manufacturers won’t even sell you the parts if you can’t prove you’re a qualified professional. Why is this the case? Think of your garage door springs as large rubber bands stretched to the limit. We’ve all experienced the shock and pain of being snapped by a rubber band. However, we’ve never heard of a snapped rubber band breaking a window or, worse, an arm. The same principle behind the rubber band is the one that governs garage door springs. They stretch and they are under tremendous tension. If they break or break loose from their anchor spots, all of that stored energy is released only this time the rubber band is made of metal. Learn more about the types of garage door springs.